ULAANBAATAR, Mongolia – Not long ago, 22-year-old Enkhtsetseg would have had to travel for nearly two days to reach treatment for serious pregnancy complications. Maternal health specialists were available only in Mongolia’s capital, Ulaanbaatar – about 1,000 km from her home in Gobi-Altai Province. But thanks to the country’s Telemedicine Network, she has been able to receive specialist care through a computer screen. “We are very happy this technology is available in our hospital, as it’s something we really needed,” said Enkhtsetseg, whose doctor used the Network to consult with specialists from the National Centre for Maternal and Child Health (NCMCH), in the capital. “It’s comforting to know we can receive quality care in Altai without having to travel to Ulaanbaatar,” Enkhtsetseg added. Shortly afterward, she safely delivered her first child, a healthy baby boy. 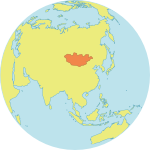 Mongolia is one of the largest countries in Asia, yet it has fewer than 3 million people, making it the most sparsely populated nation on the planet. A journey to the capital for treatment can easily drain a family’s resources, and the travel is often gruelling, ranging from seven hours to three days on crowded buses, over unpaved roads. These difficulties are all the more challenging for pregnant women experiencing complications. In 2007, the Telemedicine Network began bringing critical maternal health care much closer to home. Supported by UNFPA and the Government of Luxembourg, the programme connects provincial hospitals with experts at NCMCH. Using software from partners at the Swiss Surgical Team, local doctors are able to consult with experts, in real time, without having to leave the examination room. Today, all 21 provincial hospitals are participating in the Telemedicine Network, which has the potential to reach 40,000 rural pregnant women each year. And the Network does much more than simply provide a remote connection to the capital. An online learning platform was developed with NCMCH, along with training materials and updated clinical guidelines. “Telemedicine is a great tool to deliver health care and train professionals in the remote areas of Mongolia,” noted Altanchimeg, a midwife at NCMCH. To date, hundreds of medical professionals around the country have received training through the Telemedicine Network, and new learning and treatment opportunities are introduced all the time. A joint course was recently developed with the International Society of Ultrasound in Obstetrics and Gynecology, teaching health workers to diagnose complex clinical conditions. And with Auckland University Hospital, the Telemedicine Network is establishing a training programme in maternal-foetal medicine. NCMCH is also working with the University of Hong Kong to support advanced reproductive health services. The Network is also helping to raise awareness of the needs and concerns facing the country’s rural and provincial hospitals. “We are very happy that this technology has helped us to work together with our colleagues in rural hospitals, and exchange our experiences, and learn from each other,” said Altanchimeg.